Dr. Caplan on FALSE "mental illness"
Targeted for exposing lethal vaccines! This is not a "cause." Its a fight for our lives. Condensed beams of radio waves can be shot into the human brain and other organs, in order to effect their functionality in ways that range from mental numbness, brainwashings and physical illness . . .to brain damage and death. And unfortunately, this is happening to people. peaceful fight for humanity's safety and freedom. This site aims to help bring public awareness to a crisis to a Technological Holocaust, which lurks in the shadows of a Covert War. Though there is some controversy about if this is an actual holocaust or not, I have decided to retain the title, because I feel that it is. It is not possible to accurately determine how many people have been harmed, at this point. In my opinion, just one person psychologically mutilated or covertly murdered with what has been classified as "non- lethal weapons" is too many. But in the tiny corner of it that I have directly experienced and witnessed, there are dozens of victims, and most of them remain unaware, due to a lack of awareness of the technologies that are being used on us. 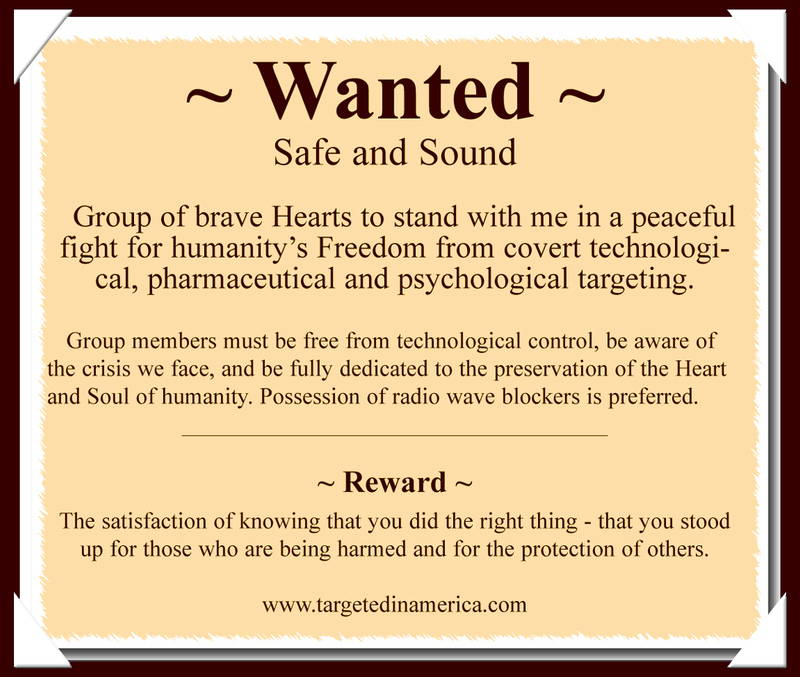 Criminal use of radio wave technologies is a serious threat to ALL of humanity. As you face this devastating reality, your mind may not want to believe it and your Heart may be struck with a pain that its not going to want to feel, but I hope you find the courage to face and feel it anyway, because out of those feelings, may be berthed a new remedy that has no other way of existing. We need that remedy. The dangers in ignoring criminal use of radio wave technologies, and allowing them to continue and grow, can not be under stated. What are the technologies and how are they used? I'm not a technological expert. My experience/wisdom is in being a long term victim of criminal use of Microwave and Laser Weapons, as well as a witness to various targetings of dozens of other people. But, due to my experiences, I can give you an introduction to this crisis, with the hope that you will do more research and strive to help expose, and bring an end to, these horrible crimes against humanity. That I know of there are five different types of technological targeting. 1. Remotely inflicted behavior modification or brainwashing on NON-consenting human beings. 2. Remote technological torturing of Targeted Individuals in ways that intentionally inflict physical and psychological distress. 3. Remote technological medical experimentation on NON-consenting human beings. 4. Eugenics based microwaving that inflicts terminal illnesses like lupus, leukemia, heart attacks, lung diseases, diabetes, tumorous cancers, adrenal gland failure, kidney failure...etc. 5. Criminal use of weather modification technologies and laser weapons, which can instigate lethal storms as well as earth quakes and possibly even volcanic eruptions. Due to what I've witnessed and experienced, I feel certain that at least SOME of the technological targeting is being done VERY remotely. I have been being targeted with various types of microwave and laser weapons, which have the capability of quickly circling around and coming at me from the sky, and from different directions and angles, when I am in areas where there are no other houses, vehicles, cell towers...etc. The only technologies, that I know of, which can do these types of maneuvers, are satellites and technologies that bounce radio waves off of the ionisphere to be redirected. Among the names and applications of these technologies are; Psychological Warfare, Psychotronic Weapons, Microwave Weapons, Behavior Modification Technologies, Synthetic Telepathy, Acoustic psycho-correction, Satellite Terrorism, Remote Neural Monitoring, Voice of god Weapon, Radio Frequency Weapons, Bio-communications technologies, Radio Wave Mind Control, Electroenergetics, Electronic Harassment, Directed Energy Weapons, Brain Warfare, Geophysical weapons, Mind Machine, Psychological Language Machine, Acoustic Heterodyne Weapon, Embryonic Holography, Optogenetics, Electromagnetic Stalking, Bio-communications Technologies, Radio Wave Mind Control, Microwave Mind Control, Bio-Electromagnetic Technologies, Electronic Harassment, Directed Energy Weapons, Brain Warfare, Bio-energetics, Electromagnetic (EMR) mind control, Electroenergetics, Geophysical Weapons, Psychoneurological Weapons, M.I.N.D. - Magnetic Integrated Neuron Duplicator, Psychic Warfare, Acoustic Heterodyne...etc. There is scientific proof of the existence of these technologies and the fact that their criminal use has been kept secret is of concern to many. Experimentation with the effects of radio waves (microwaves) shot into various parts of the brain and other organs are reported to have begun by the 1970s. Some reports state that the British were perfecting the technologies in the 1950s. World War Two victims of Nazi concentration camps are reported to have been experimented on with microwaves. In 1965 the American New York Times published an article on the remote mind control experimentations of the famous Dr. Jose Delgado. Part of the MKULTRA mind control program was exposed in the 1970s. Japan and other technologically advanced countries and organizations are sure to have done some of their own. MOST of the microwave experimentation on human beings has probably never been publicly shared, because it is too criminal and inhumane for public approval. Most of the published information appears to be about the USA and this leads people to blame only the USA for the targeting. But in my mind this merely proves that the USA has been more open about it. . .and therefore probably less guilty. I am not saying that America is perfect, but I believe that America has been being slandered and infiltrated and struggling to retain its Freedom. My experiences and insights tell me that there are at least two levels of targeting happening. One seems to be a long term covert effort to take over the USA and the Liberty its citizens have fought to retain. I believe that the USA is being infiltrated and that some of our own civilians, military and government personnel are victims of remotely inflicted mind control, and that brainwashed victims have been being recruited into a deceptive program that is now aiming for complete control of the USA and its citizens. Through this process, it appears that USA citizens and government are being pitted against each other. The manipulations to inflict discord and distractions are many. I pray that, through the exposure of the technological part of these crimes, the Hearts of USA citizens and government officials will unite into a PEACEFUL stand for Freedom, and then help other countries do the same, because it appears that the long term goal of the technological targeting seems to be complete control over humanity. Another level of the targeting appears to be being performed for experimentation and also as literal satanic types of torture. I'm not sure if it is all being done by the same group, but it appears to be. Scientists and researchers have reported that, since at least the 1960s, behavior modification programs have been being implemented, around the globe, through remotely directing beams of encoded radio waves into the brains of individuals or into whole communities and countries, in efforts to accomplish brainwashings. Though most people seem totally unaware of this, it is not a new occurrence. It appears that USA President John F. Kennedy tried to expose this crisis in 1961 in a speech he deliver to the press. There appeared to be an attempt to expose and stop criminal use of radio wave technologies, in the 1970s, when a small part of MKULTRA and Russiaâ€™s microwaving of the US embassy were exposed. Apparently, it was thought to have been stopped. But I, along with many others, feel certain of the sly continuation and growth of these technological crimes. I feel that the most dangerous part of the technological targeting is remotely inflicted mind control, because it robs us of the psychological freedom which is needed for our natural process of personal and spiritual growth. Most mind control victims seem to remain completely unaware of what is happening to them. They think all is fine, but are not being allowed to freely follow their own thoughts, feelings and instincts. Some victims are aware and are fighting for their lives while being physically and/or psychologically tortured. Some are terrified and do not know what to do. And some have been psychologically mutilated to the point of ending up with permanent brain damage. When I think of them, it burns, like a painful fire in my heart. Its just too horribly wrong! And I pray that these lethal crimes can be realized and stopped before too many more people are hurt, and before humanity, as a whole, completely loses the personal Freedom that is need, in order to grow and evolve into all that we are meant to be. Please think about this long and hard. This is Truly the most dangerous thing humanity has ever had to face. . .and it MUST be faced, because it has already been happening for too long and is already harming too many. Perhaps this next statement can help you to realize how wide spread this crisis is. . .
Around the year 2000 my concern shared a prophetic dream, which showed criminal contamination of a public water supply. By May of 2001, most of my pets were dead or missing, my daughters and I were suddenly surrounded by at least 5 unusual deaths, unbelievable levels of chaos and a suspicious fire in my home, which destroyed most of my writings...etc. Pieces to this puzzle are now clicking together. According to experts the mind control, parts of Microwave Weapons are most successful on people who are taking mood altering drugs, like anti-depressants. In 2008, news reports stated that these sorts of drugs were being found in around 24 major public water supplies in the USA. And I have reason to believe it is not from "run off." The general public being drugged through our public water supplies suggests that the radio wave brainwashings are aimed at most of the USA population. Around the late 1980s or early 1990s I remember reading a medical report about the new development of technologies that would enable laser surgeries to be performed by satellite, on a patient, while he or she is in their own home. This appears to be hushed since then. Why? It appears that these weapons are being used on Targeted Individuals. And I know a woman who appears to have been used for remote technological medical experimentation. I hope the media runs with this soon, because the psychological Freedom and health of media and government personnel has been as much at risk as ours. . .perhaps even more so. And people dying for telling us, but we're too blind to see. And we just accept it, because we don't know. But the Truth is being buried deep inside our graves. 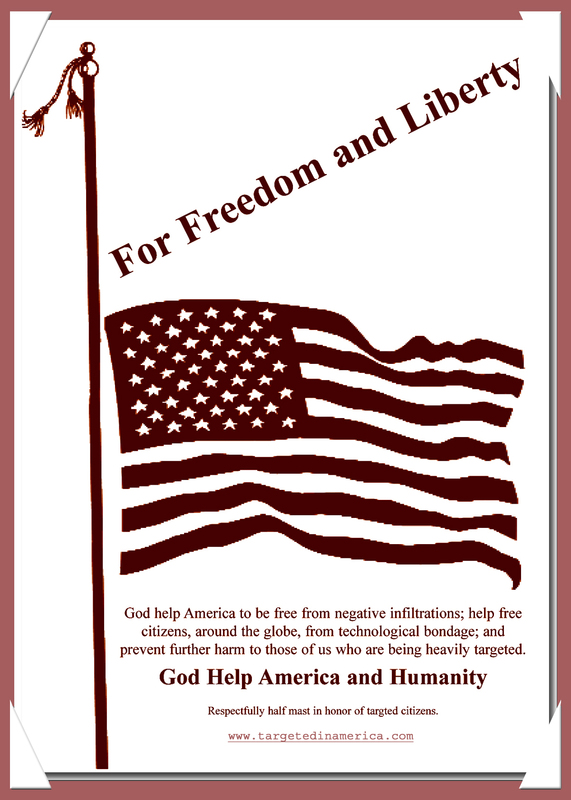 The freedom that we boast of in the "good old USA"
Has been being secretly taken away. Return the Constitution to it's original track. This site also hopes halt the growth of deceptive recruiting of unaware citizens into a covert program that is used to target fellow human beings. I feel that the secrecy surrounding covert technological crimes is enabling their continuation and growth, which is a serious threat to the future safety of all of humanity. Many may wonder why the government secrecy around this continues. The answer to this question, and the existing technological crisis, is NOT to blame or go against our government or media, because they probably have good reason to have not informed the public. Perhaps they are concerned that the exposure will cause a panic. . .or perhaps they want to wait until they have the problem more under control. I don't want to judge them, although there are times when I have. I want to trust that they are obviously doing what they think is best. And I need to also follow my own heart and do what I feel is right. A part that now deeply concerns me is the fact that I know only three families of people who work for the FBI and all three of those families appear to be being targeted in various ways. Since I realized this, the question that haunts me is "if the FBI is also being targeted, who is going to help the rest of us?" But I am working on letting go of this concern and trusting that there are some good people in our government, who are working on this problem. But I hope it is exposed soon, because I do not feel that the public will panic if the exposure is handled properly - with honesty and reassurance and compassion and encouragement for people to pull together and help each other instead of overwhelming government agencies with phone calls. I feel that most people can sense that there is something wrong and that not understanding exactly what it is has them in a state of confusion. I feel that the truth coming out can reassure many, validate many and give us all an opportunity to pull together and help each other through it. 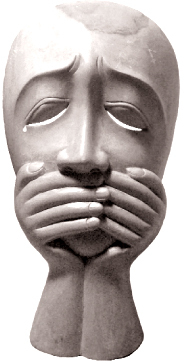 Though I am being more heavily targeted, I feel that I must continue helping to expose these crimes, because the magnitude of pain and suffering that I have experienced, and witnessed in other victims, is just too horrible to remain silent about. . .especially since I see no promise of its end. I pray that this site helps to instigate the end of the technological targeting of humanity. For the freedom we've not attained yet. I hope you open your heart and see. This covert war is not meant to be. Copyright 2011 - 2016. Copyrights on various enclosed materials are also held in earlier years. Information on this site is based on my own personal experiences and beliefs and then backed up with links to what I've found for scientific proof. I hope it is helpful to you. 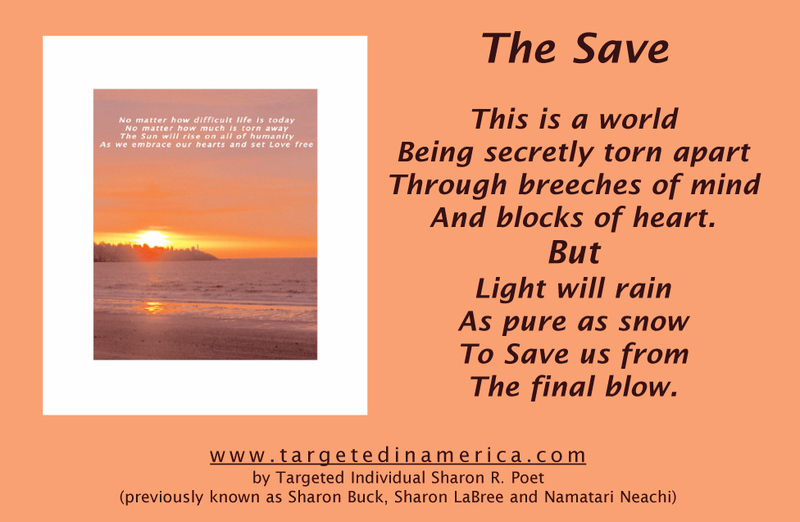 Please keep in mind that those who target me/us sometimes interfere with my writings. I am doing the best I can to keep this site going under indescribably difficult circumstances. So, please look past possible bloops and let your Heart focus on the core issues, which need your attention.